This stimulating collection of essays, mostly concerned with subjects taken from Slavic literatures, is at once scholarly and reflective. The volume opens with a true story, "Brognart," which is a confession of the author's remorse based on conflict with French intellectuals. "Science Fiction and the Coming of the Antichrist" concerns Vladimir Solovyov. "Krasinski's Retreat" is another return to the author's student readings, which attempts to determine how a Polish romantic poet could write in 1833 a drama on the approaching world revolution. "Joseph Conrad's Father" sketches the biography of a poet and revolutionary and also throws some light upon the fate of the hero of the last chapter. 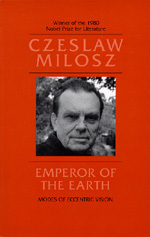 Czeslaw Milosz (1911-2004) was born in Lithuania and was Professor of Slavic Languages and Literature at the University of California, Berkeley. In 1980 he was awarded the Nobel Prize in Literature.